Supreme Court Delivers TKO Win On Political Apparel Ban The high court on Thursday struck down Minnesota's broad ban on "political" apparel inside polling places. But justices said similar, more narrowly written laws in other states are likely fine. Joseph and Maria Caruso vote inside the Early Vote Center in downtown Minneapolis on Oct. 5, 2016. The Supreme Court on Thursday struck down a Minnesota law that prohibited voters from wearing politically themed items inside polling places. The decision was something of a technical knock-out, a TKO, for those challenging the law, because the court, at the same time, reaffirmed the notion that political speech can be regulated at polling places in order to prevent arguments, harassment and voter suppression. Every state bans some form of political apparel inside polling places. The laws were enacted in late 1800s and early 1900s to put an end to rampant violence, harassment and intimidation at the polls. The problem with the Minnesota law, the court said, is that the state failed to "articulate some sensible basis for distinguishing what may come in from what must stay out." At the same time, though, the court said states are entitled to exclude some political apparel in order to preserve "an island of calm in which voters can peacefully contemplate their choices." Writing for the court, Chief Justice John Roberts said Minnesota's definition of political apparel, combined with the "haphazard" guidance provided by state officials to poll workers, rendered the statute unconstitutional. Because the state takes the position that it can ban apparel with a message on any subject on which a party or candidate has taken a stand, Roberts said, any number of T-shirts or buttons could be banned from the polling place, even those with the insignia of the AARP, the World Wildlife Fund or Ben & Jerry's, all of which take positions on some political issues. The state's argument, he said, creates "riddles" that even the state's top lawyer could not solve at the oral argument in the case earlier this year. At the argument, the state's lawyer, in response to pointed questions from the justices, maintained that a T-shirt emblazoned with the First Amendment would be allowed into the polling place, but not a Second Amendment T-shirt. The court stressed that in the context of polling places and the areas immediately surrounding them, states are not required to achieve "perfect clarity" in their regulations, but, the court said, the Minnesota law and regulations are simply too broad and too unreasonable to swallow. 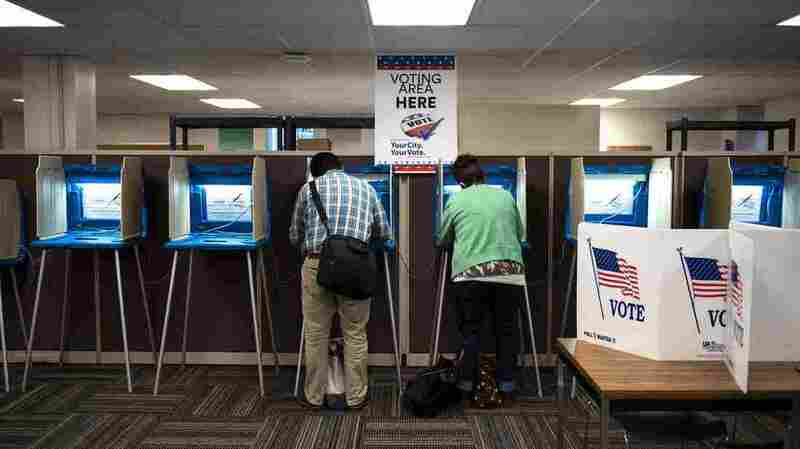 The decision is "good news for people who worry about the polling place turning into yet another place where there's a kind of riotous and disruptive political speech," said Doug Chapin, direction of the Election Academy at the University of Minnesota. He said that in answer to the challengers' contention that polling places have to be open to all kinds of speech, the court's answer was, "No, polling places can be insulated from that kind of back and forth. We just need states to be much more clear about what is and isn't allowed." The case before the court was brought by voters from a group calling themselves Election Integrity Watch. They wore Tea Party T-shirts and buttons that said "Please I.D. Me." After poll workers asked them to either remove or cover up their message, they sued, contending their First Amendment right of free speech had been violated. On Thursday, they won, but with some huge caveats giving states considerable latitude in barring political messages at the polls. In his opinion for the court, for instance, Chief Justice Roberts specifically said that the state may prohibit messages like the "Please I.D. Me" buttons, which poll workers worried were intended to mislead voters into thinking they needed a photo I.D. to vote. But Roberts said that Minnesota had not written its law to deal with such misleading messages. Michael Waldman, president of the Brennan Center for Justice at New York University, said that his concern about Thursday's case was that it "not be a license for vigilantes screaming about voter fraud to come in and make it so that it's harder for people to vote." Fortunately, he said, "What the Supreme Court said is that the state can still restrict that kind of conduct." Jeanette Senecal, senior director at the League of Women Voters, agreed. "All the state legislature needs to do," she said," is go back and write a law that is more clear." At the state level of the League of Women Voters, however, there was some consternation. "The decision may increase the likelihood that malicious individuals will attempt to intimidate or confuse other voters at the polls," said Michelle Witte, the Minnesota state executive director of the league. "We now rely on the Minnesota state legislature to pass a new law that has more clarity to meet the court's standards." The Minnesota legislature is not scheduled to reconvene, however, until next January, after the November election. Most states are not expected to face Minnesota's problems, as the Minnesota law was considered the broadest in the country. That said, free-speech purists are not giving up. Ilya Shapiro of the libertarian Cato Institute insisted that there is still room for a further challenge to more narrowly drawn statutes. "I'd like to see a challenge to a law that actually specifically prohibited simply wearing a T-shirt with a party logo or the name of a candidate," he said. The court's opinion, however, approvingly cited several state laws that specifically ban such T-shirts. Dissenting from Thursday's opinion were Justices Sonia Sotomayor and Stephen Breyer. They agreed with the court's reasoning, but said the case should have been remanded to the Minnesota Supreme Court to see if the state court could uphold the statute by construing its terms more narrowly.